Sorry everyone for being so quiet - leaving my old school and starting high school with all new people was quite an adjustment. Also, I was given doctor's order in September to take 6-8 weeks off to allow some damage I did to my vocal chords to heal. So, in addition to getting my first real job (I definitely know that a career in fast food is not for me...) I have been focusing on my schoolwork and being an annoying pest to my family and friends instead. Now for the good news - despite still having to deal with some chiropractic issues, not only have I been singing again (finally!) but I have a couple of new gigs you are welcome to come and see!!! On Saturday December 7th I am performing at the Alberta Beach Active 50 Plus Club's Christmas dinner. Tickets: $18.00 Members $21.00 Non Members, Mark 780 892-4422, Joan 780 924-2186, Shirley 780 924-3272, Doors 5:30 Dinner 6 PM Please bring an unwrapped toy for a child or teen and something for the Christmas food hampers. You can get more info here! My dog is so cute!!! On December 12, 2013, I'll be performing a set for the ShineFM Kids' Kottage Radiothon. We are performing on the HMV Stage at West Edmonton Mall. The Radiothon runs from 6am to 6pm, and I will be on stage at 4:30pm. (What a great excuse to leave work early, no?!) You can find out more about Kids' Kottage here. Check out our rainbow of fancy all-natural eggs! His official fundraiser for his OMD is now over (Thanks you to everyone who donated - we raised almost $600 to pay down his dental bill!!!) but if you'd like to help Kailer keep proving the experts wrong, please contact Academy Dental at 780.423.1869 to make a payment directly on Kailer's account. Lastly, my whole family has been trying to eat healthier, spend more time together, and make some big positive changes in how we interact daily. So far, I'm loving how much closer I feel to my family. Lastly, some SUPER exciting news about my brother Kailer. We were told he would never tie his shoes. Well, guess what! Hello, everyone!!! A family friend had to cancel at the last minute and so we have TWO TICKETS up for grabs, along with a signed copy of my demo CD, a framed picture, an official Kailee fridge magnet, and one of my super awesome "HELLO my name is" stickers. All you have to do is click any link on this page. You can even click on the "win" button below and it will take you right to the Facebook Contest. You will have to LIKE my page to enter, and you must answer the skill testing question correctly as well as SHARE the contest on your page or with your friends. If you get the answer wrong (hint: the link with the correct answer is right there) or you do not share the contest after completing your entry, you WILL NOT be eligible to win. Complete rules are on the Facebook page. Hurry up! Tell your boss you might need Friday off. AND GO ENTER NOW!!! Hi, everyone! Here's a little Sunday Sweet - me practising a little Ave Maria (Beyonce-style) for you. I've never. Ever. Ever. rehearsed so much, so hard as I have in the last 2 weeks as I prepare to perform on the ATB Homegrown Talent stage at Big Valley Jamboree this coming Friday. It would be so amazing to perform on Mainstage on Sunday - please wish me luck and send me winning vibes! I'm also learning some new tunes and brushing up on some old ones so I can get a song list together for a few upcoming busking gigs. You can come here to check the Performance Schedule or join me on Facebook or Twitter to keep current on when and where I'm performing in coming weeks. Thank you for all the love and support! Like the fan page on Facebook by clicking the link or that little button over there on the right to join in the next contest giveaway starting Monday, July 29, 2013. Kailee has just added two new performance dates to her schedule. She will be performing during services at 10:30am on August 24, 2013 at the West Edmonton 7th Day Adventist Church located at 9949 - 149 street, NW and at the Tour of Alberta performance in Sir Winston Churchill Square at 11:15 am on September 2, 2013, both in Edmonton, AB. Both performances are available free of charge to the general public. I had my first professional photo shoot ever yesterday. It was insane fun and I was so excited to see the pictures! She also took me outside and made me run around in a mosquito-infested field with an umbrella. After that, the hair and make-up people got me ready for the first set. My mom was the unofficial assistant and got to fix my clothes when they looked weird. Thank you, Mommy! I love you! I had a tiny pimple show up on the morning of the shoot and the photographer said, don't worry - if it's temporary I take it out. Then we asked if we got all of the pictures and the photographer laughed, because there is so much work to do in Photoshop. You can really see how much work has to go into each picture in this unedited pic (below left) compared with the final image (below right). But even with all the laughter we managed to get some amazing pics. Right towards the end of the photo shoot the rest of my family stopped in. My littlest brother decided he wanted a jumping picture, too. I think he looks like a flying pencil. Are you coming to see me on the ATB Homegrown Stage at Big Valley Jamboree on August 2nd, 2013? If you are, please come and say hi after the show - I'd love to meet you! Please wish me luck to win a performance on the main stage on August 4th! I love meeting other musicians! 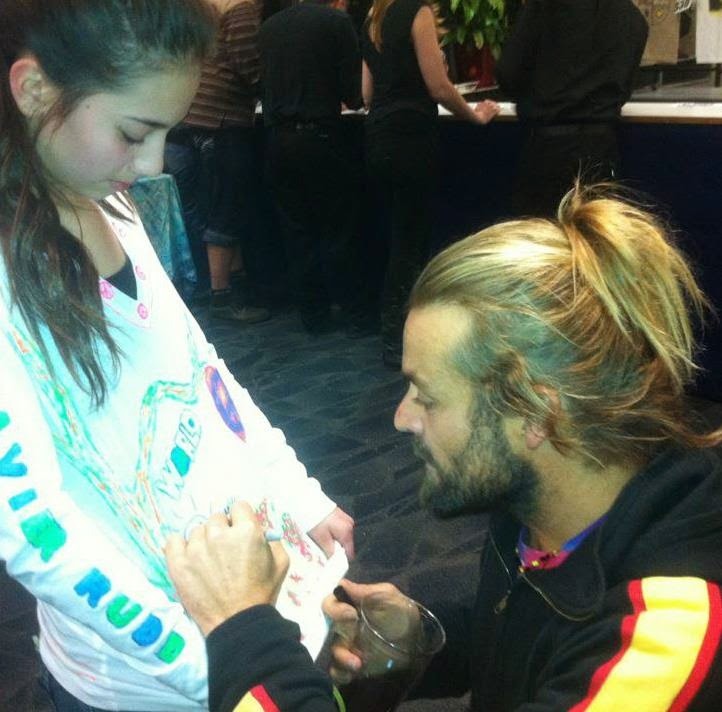 This was such a great day - I got to meet Xavier Rudd! Check out his music here!